The engine cooling system has had its fair share of nips and tucks over the last few decades but the principal behind it is a simple one and stays the same – keeping the engine within a certain temperature range and providing heating for cabin occupants. Progress in cooling systems, as with most vehicle systems these days, is being pushed by emissions and efficiency. Several tweaks to age-old components have played a part in the modern vehicle being more powerful, using less fuel and having cleaner emissions than their predecessors. We are a long way from the days of air cooling and now seeing computer-controlled versions of well-established cooling components, including electronically assisted thermostats, pulse-width-modulated fans and electric water pumps to name a few. With these components come new fault codes and new ways to diagnose cooling systems. Why are there wires going to the thermostat? Electronically-assisted thermostats have been around for decades now and their operating principle is still very much the same as their earlier, mechanical ancestors. The main drawcards of electrical control over the thermostat are increased power and improved emissions. In a perfect world the optimum combustion process in a passenger car occurs at about 110°C. With mechanical thermostats a middle ground must be struck and their rated opening temperature can open much lower than 110°C to allow a ‘buffer’ for high-load situations. Electronically assisted thermostats have the advantage of being able to offer a much higher opening temperature. These thermostats can remain closed as high as 110°C – at this point they will open unassisted as the wax pellet melts, just the same as a regular thermostat. This creates the ideal temperature environment for emissions and efficiency. The computer uses preset maps and watches several parameters – including engine load, vehicle and engine speed, coolant and intake air temperature – to operate the heating element and quickly open the thermostat further. This offers a rapid increase in cooling and drops the engine below 110°C. The lower temperature is ideal for making power, allowing ignition timing to be advanced closer to optimal without increasing knock. For this reason, the heating element is most often operated under high-load conditions to increase cooling. The heating element will also be operated, even at low load, if the coolant temperature rises above 113°C to combat overheating. The graph on this page – a simulated map that controls the thermostat heating element – shows what the computer is thinking (pic 1). 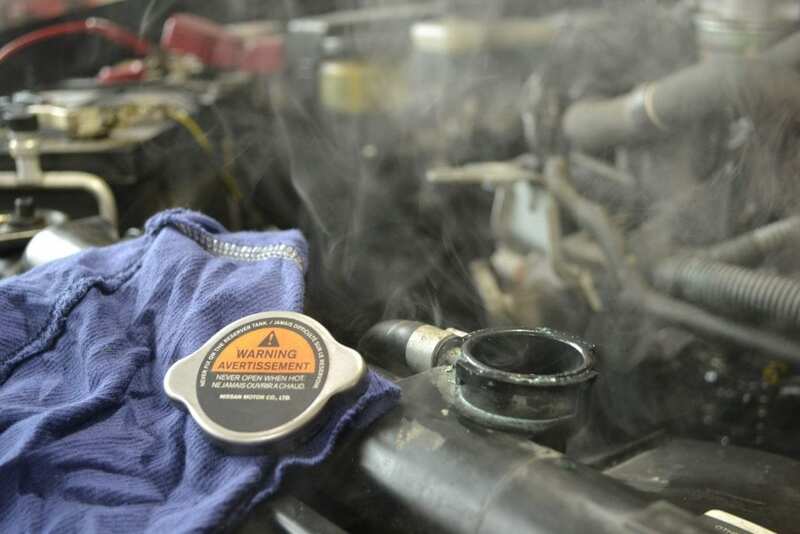 The coolant temperature is lowered as vehicle load and speed increases. From belt-driven fans to low/high staged relays, we now commonly see vehicles with pulse-width-modulated cooling fans. Pulse width modulation ticks all the efficiency and NVH (noise, vibrations, harshness) boxes for manufacturers. The benefits of precise fan-speed control are obvious but often the speed range is not infinite. It is quite common to have preset stages of fan operation, loosely evidenced by only a handful of speeds being available when bi-directionally controlling fans through a scan tool. Understand that engineers have worked long and hard to perfect these speed stages to provide a balance between effective cooling, energy efficiency and driver comfort. Under certain conditions a 64 per cent duty cycle may be ideal for cooling but 61 per cent may be a better option due to the noise and vibration of a particular fan assembly. With a 10.61 per cent duty cycle (blue) commanded by the computer, this small cooling fan draws only 300 milliamps (red) (pic 2). For testing purposes, if no scan tool bi-directional tests are available, the old theory of increasing load to get the fans on high still holds true, so set the a/c to max and turn on as many loads as possible. With a rise in commanded duty cycle to 38.55 per cent (blue), fan current increases to 814 milliamps (red) (pic 3). The theory for going electric with water pumps seems logical – old mechanical-driven pumps, after all, rob precious power and economy. Critical thinkers might argue that you cannot create or destroy energy, so isn’t this just putting more load on the belt-driven alternator to provide power for an electric pump? Well, there’s a little more to it than that. Mechanical water pumps are directly linked to engine speed, so often pump more coolant than is needed. Conversely, sometimes more coolant flow would be ideal, such as during engine shut-off after hard driving. The main benefit of an electric water pump comes from its variable nature. Pulse width modulation allows the computer to tailor fit the coolant flow to your engine’s current situation, and as sparingly as possible. Electrification also provides several side benefits, such as the reduced complexity of belt/chain designs and the ability to remotely mount the pump in unused space. Expect to see more of these modern water pumps because they are ideal for hybrid and electric vehicles, which don’t have the luxury of a constantly spinning mechanical engine. If you think we’ve made progress in cooling systems, grab an iced tea because the future is hot. The latest semi-conductors used in hybrid and electric vehicles produce a heat flux measurement of 400W/cm², comparable to the surface of the sun! Huge cooling requirements will be demanded from stationary vehicles and SAE J1772 electric-vehicle connector standards allow for up to 240kW of charging power. The sensitivity of electronics creates the need for very precise and component-specific cooling and this is where glycol-coolant-based cooling systems show their age. Complex systems with handfuls of small passages become hard to bleed and regulate. The various metal components that require cooling create bi-metal corrosion issues. We are starting to see new solutions. The BMW i3 is an electric vehicle that uses the existing a/c system to cool the battery pack through refrigerant tubes mounted in a cooling plate, which acts a heat sink. But while the technology is changing the customer complaints will remain the same. When Mrs Jones complains that her feet are cold on morning drives, the keen technician will complement their old-school physical tests and inspection with the interrogation of data from all modules. The poorly trained will quote a pair of slippers. What’s new in vehicle diagnostics in 2017? What can you expect from our Logan auto repair shop?